» Aquatalia by Marvin K.
» H.S. Trask & Co.
Offering a wide varity of products relating to shoes which includes this item, BOSS Hugo Boss Handbags - Shopper (Black) along with quality bags, cheap and much more. Zappos does offer free shipping on all orders and top that off with a guarantee on all name brands such as BOSS Hugo Boss Handbags items. 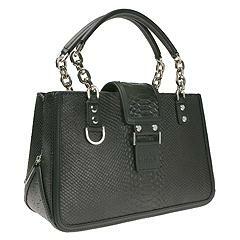 Shopper style handbag made of python embossed leather. Two compartments separated by center zip pocket. Dual straps. Nickle hardware. Top tab over closure. Bottom feet to protect handbag when set down. Dimensions: 13 1/4"" wide x 5 1/2"" deep x 8 1/2"" high."